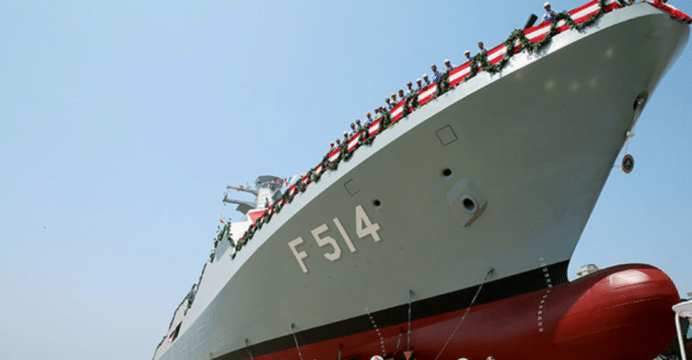 The Tuzla Shipyard launched the fourth MILGEM Ada-class corvette (TCG Kınalıada) for the Turkish Navy on Monday, July 03. The TCG Kınalıada’s keel was laid down in October 2015. Presiding over the event, Turkish President Recep Tayyip Erdoğan lauded the efforts of the Turkish naval industry for fulfilling the first major phase of the MILGEM program, i.e. the construction of four corvettes. According to Erdoğan, Turkish industry content now accounts for 65% of the MILGEM Ada corvette, with more than 50 Turkish entities, including companies and institutes, involved in the program. Named after the Istanbul Princes’ Islands, the Ada-class has a displacement of 2,400 tons at full-load and a length of 99.56 m. Intended to lead in anti-submarine warfare (ASW), the Ada-class can provide support for littoral and offshore operations, such as patrol and policing. The MILGEM Ada is armed with one 76 mm main gun, two triple ASW torpedo launchers, two quad-cell anti-ship missile (AShM) launchers, two 12.7 mm guns and a point-defence missile system for defensibility against nearby aerial threats. Currently, two MILGEM Ada-class corvettes – the TCG Heybeliada and TCG Büyükada – are serving with the Turkish Navy, with the remaining two – TCG Burgazada and now TCG Kinaliada – undergoing sea trials. The TCG Kinaliada launch was accompanied by the keel-laying of the TCG Istanbul, the first I-Class multi-mission frigate. This follows the TCG Istanbul’s steel-cutting ceremony in January. While derived from the same design as the Ada, the I-Class is 14 metres longer and has a displacement of 3,000 tons. In addition to two octuplet-cell AShM launchers (for 16 missiles), the I-Class is also equipped with a 16-cell vertical launch system (VLS) for surface-to-air missiles (SAM). Turkey intends to complete the TCG Istanbul by 2021. Turkey intends to produce four I-Class frigates: TCG Istanbul, TCG Izmir, TCG Izmit and TCG İçel. Long-term development plans center on the TF-2000 anti-air warfare (AAW) frigate. Since its inception, the MILGEM Ada has drawn overseas interest from several of Turkey’s defence clients, such as Pakistan, which signed a letter-of-intent in May to acquire four corvettes. Ankara is also hoping to sell naval solutions to other markets, such as the Middle East and South America. The Turkish industry has opted to continue developing the Ada’s design to fulfill added requirements, such as medium-range SAM compatibility. The I-Class is an example of this effort, but the LF-2400 design – while similar in length to the I-Class – is close to the Ada in displacement (at 2,350 tons). The reutilization of the core design may help control costs, especially when these designs are to compete for export orders.